You continue to blow me away, friend. I think my favorite bit, just for the humorous relatability (this may not be an actual word…) is “Gifted kids are, in reality, kids. They get excited about stuff like Minecraft, princesses, farts, and candy.” Thank you for this! I want the secret handshake! Bah ha ha ha ha! Totally! Thank you so much for writing and sharing such an accurate and passionate article! I am a gifted specialist and your words and thoughts are spot on. Thanks for sharing. Oh goodness, thank you so much for this! Hi can I contact you? I cannot even begin to count the number of times I’ve been asked by other parents if our son is autistic or, in the case of a few momentarily-brazen souls, I’ve actually been TOLD by other parents that he is. We have had him evaluated for that possibility—twice, actually, because as a first time parent, I worried that I was misreading him. But people just cannot seem to stop themselves. Sigh…I wish everyone would read this and recognize their own assumptions in it. Goodness I relate to your frustration. Parents see and worry over their kids more than anyone – believe us when we say we’ve noticed behaviors long before anyone else! And yeah, it’s not a threat. He’s a sweet little boy. Good luck to you, and to all of us! Great article, Jen. Great read thank you! I’ve got four sons and three so far tested in HG and PG range. And all sooooo different!! Another amazing piece! I love you! I love that I have someone like you who is on my side! Someone to live this life with, someone who can relate with how I feel, someone who is so spot on and puts all the feels so beautifully into words! Thank you! Whoa. This is so perfect. Exactly right on, my friend! I’m the mother of three highly gifted kiddos, and as mentioned before, three UNIQUELY different kiddos, at that! In fact, my eldest asked me if our middle was autistic, because she is “different” than he is. I even questioned myself at that point. So, we ask the doctor at the next visit if this is likely, and he looks at me like I’m crazy! And says, she is “different” than he is, different doesn’t mean autistic. Bam! 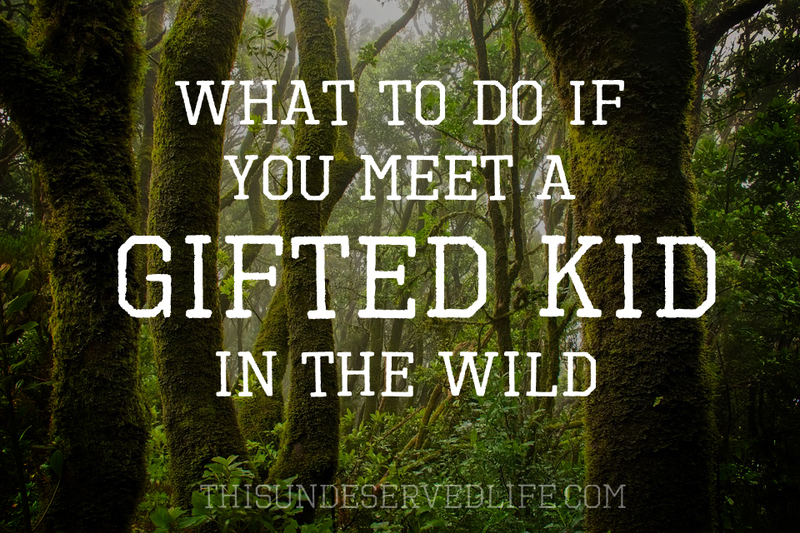 I love this line: gifted kids are one of the most underserved populations in schools, often dismissed as having no real needs or being “smart enough” to adapt themselves that they can be sent to a corner with a book and a high five. We have experienced this soooo much! It’s hard on the child! It really is! I’m so sorry this has been your experience. I feel your pain. I love love this article written by someone who really gets my reality. Thank you Jen, this is what I needed today. I have 2 under my roof and there are nights when watching CM or TBBT or even Bones occasionally, that my hubby and I look at one another and go ‘we could totally see one of them doing that’. Sometimes we kid that watching Reid, Sheldon, Hodgins, and Bones is great note taking time for knowing what to head off at the pass later. (We have a blossoming Hodgins I’m almost certain). But I’ve had people (teachers) tell me my child shouldn’t get special treatment, that I shouldn’t tell anyone he is gifted, that he just needs to learn to be bored and not disruptive. I homeschool now so they can self pace and people tell me to stop pushing them so hard, like I’m hot housing them instead of the reality where school books get locked away only for both of them to get blank paper and make their own worksheets. So few people know what it’s really like to raise these kids, yet so many have opinions about them! I homeschool my middle one now, and it’s been an amazing change. Oh, and I’ve never watched Bones or TBBT? I always say the Sheldons I have are enough! Hahahaha! This article really resonated… I can remember back to the days when other parents would comment in some surprise about my now-18-year-old, “she’s so normal even though she’s so smart!” — I never knew quite how to respond to that. I miss that brain. :). And the other one, too. Thank you for advocating in such a huge way. Gifted kids deserve it. None of it would be possible without you! Very good! Except the socially and emotionally a little behind. Not true. Absolute perfection! You found the perfect words to describe my zany life. My child and I both thank you! Thanks for the wonderful post, Jen. I love it. I have two of those adorable, gifted creatures and life is a real adventure with them. I wouldn’t want them any other way, even if I’m knackered by the evening. They bring so much bubbly joy to our family, and I absolutely admire them for how they master childhood trying every day to blend in with the other kids. However, to me, they will always stand out! I am a gifted consultant who has worked with and for gifted kiddos and their families for 25 years and counting. As I read your piece I found myself thinking, I wish I’d written this. Thank you for your thoughtful, witty, insightful writing. You make so many important points, but one that stands out to me is “ … they’re kids. Not threats. They don’t need to be taken down a notch or knocked off any pedestals.” Thank you for reminding folks that crushing one child’s ego isn’t the way to build their child’s or their own. Thank you so much, Cathy. It always shocks me how people react to these kids, though I’m sure by now you’ve seen it all! Thank you for the work you do! Wow. 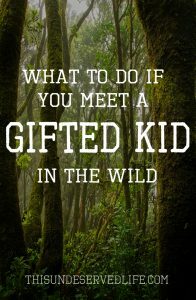 I think may be the best thing I have ever read about how to relate to a gifted kid. It’s like you reached into my brain and pulled out my thoughts. Thank you Jen. Our daughter was identified as gifted 5 years ago (she is now 11) and then ADHD and Asperger. Reading your article and I am nodding my head with, yes this is so true. This year she has had a teacher who has nearly destroyed her self esteem and she started doubting her ability. We have pulled her out of the formal classroom environment and next year she will be doing distance education at home. She is amazing, intense and so sensitive. She is loved by younger children because she takes the time to listen to their imaginations and helps them to understand some of the things they are learning at school. Older kids love to include her in their discussions and adults enjoy her company. She is learning how to manage her own age group who find her ‘abnormal and weird’ (their words). Once again, thank you, I needed to read your article today and it has put a smile on my face. Hilarious and so true! Thanks! Can I have your permission to translate this into Dutch? I’ll write your name as the source ofcourse. Absolutely! And I’d love to see it in Dutch, thank you!!! Thank you! My daughter is gifted and such a joy! I’ve been very Carey’s d aware as to support her exploring and adventurous nature! I am gifted but did not have that support and years later my self confidence is so shaky. I don’t want that for her! Thank you again! I’m a college student who is admittedly behind the curve when it comes to “real life stuff”. I’ve been to therapists where my uniqueness was passed over and broadly applied to others. It wouldn’t be until I’d tell them I’m a Mensa member that they would detract from their constant attempts to alter my ego and knock me down a peg, and even still, called “over-ambitious” when I would share my goals, ambitions, and genuine hopes for my life and future despite being twice exceptional, when in fact, it was more the case of me wanting potential to meet opportunity and possibility. I don’t see this therapist anymore. I’ve had numerous people tell me I’m “off”, “not quite right”… and one student just last semester, during a group assignment in a grief counseling course I’m taking (I’m going for a Human Services/Psych degree), flat out told me — “I thought you were autistic”. The reason for this: the information I was able to spit out in class. I’m memorizing this whole thing so that I can kindly rebut the oft-wrong stated to my face assumptions about me. I don’t go around “bragging” or “showing off”. In fact, except if stimulated and engaged, I’m quite quiet and shy. That is enormously frustrating, Samuel. I’m so, so glad you’re advocating for yourself and being YOU. I am an old (71) genius from a screwed-up childhood. There are endless reports describing the experiences of the gifted child as reported by parents and teachers. Does anyone know of research reports on how the world looks from the gifted child’s point of view in the early years, 4-7 years of age? Interesting! I’ll ask my gifted community! Hi, it´s my third attempt to leave a comment, hopefully it will work this time :). I’m really impressed by your guide. I’m so enthusiastic that I’ve translated it (freely) into Dutch, so more people can get to know about our gifted children. I hope you are okay with that? Of course I mention you and your website in the subscription. Thanx for your inspiring post.